It’s hard to believe the story in new release Can You Ever Forgive Me?, based on writer Lee Israel’s memoir of the same name. Starring Melissa McCarthy, it follows Israel’s experiences creating forgeries of letters by famous dead authors and playwrights, including Dorothy Parker, Noel Coward, and Katherine Hepburn. Director Marielle Heller’s film feels like a bit like a slow burn, but it’s a stunner. Firstly, McCarthy’s portrayal reaffirms why she is, in many ways, unique in all of Hollywood. Quite frankly, I can’t imagine Julianne Moore, who was originally cast, playing the lead. It’s not that Moore couldn’t do it, but McCarthy has built a career on playing both real and invented characters that are often not wholly likable, to great success. McCarthy embodies Israel, a woman who repeatedly mentions she prefers her cats to human beings, and who approaches every conversation without a shred of concern how she’ll be perceived. Those of us who hang around writers have met a number of men and women like her. McCarthy mines the elements in Israel’s character that make her universal or everywoman enough for the audience to understand, if not condone, her actions. She should be noticed at awards time, but she is often ignored by those handing out trophies. She has created her own path in a business that denies recognition and approval to women who don’t ‘play by the rules’. Maybe with Can You Ever Forgive Me?, this year will be different. Israel was a biographer who wrote about movie-geek favorites like Tallulah Bankhead, but her style and subject matter went out of favor in the 80s. She burned bridges at the various editing jobs she held to make ends meet, and after being fired and finding no work, she stumbled onto an old letter by Fanny Bryce in a library. When trying to sell it, the dealer mentioned it would have gotten a higher price if it were more exciting or revelatory. This gave the out-of-work writer inspiration to take on the voices of old performers and artists, and she began forging letters, and selling them to rare book dealers and collectors around the country. She was aided by sometime-friend and partner in crime Jack Hock (Richard E. Grant), who also sold the letters until they were flagged by a few particularly savvy collectors. Grant is always a welcome costar, and is particularly winning as Hock. He’s never met a film he can’t make better with his character choices, which often involve a delicate balance of quirk and nuance. I am a woman leading a double life of film journalist and film art gallery owner. I have a particularly strong connection to this subject matter. The idea that someone could get away with something like this, for any amount of time, is no surprise at all to me. As an expert in animation and some aspects of illustration art, I’ve covered auctions where I’ve flagged faked or misrepresented items, been assured they’d be removed from the listing, only to see them sell for many thousands of dollars. Once, I was contacted by a someone who was interested in selling his vast collection of art by Keith Haring, Charles Schulz, Dr. Seuss, and Andy Warhol, among others. I took a trip to assess the art, took pictures, and began research on whatever I didn’t yet know about their careers and art. I’m not sure why this guy thought I wasn’t going to figure out he was a fraud, but after some digging, I discovered all of it was forged. In fact, now online as a representative example of several of these artists’ signatures is the fake one. This forger’s vast number of sold images has filtered into the art world, blurring what is real. Many of the dealers and collectors I contacted just went on selling them. My story will resonate all the more if you see Can You Ever Forgive Me?. There is a scene where I just started shaking my head and took a deep sigh. Meanwhile, what a story. It’s a fascinating look into a world many know little about, and imagine can’t possibly be that lucrative. 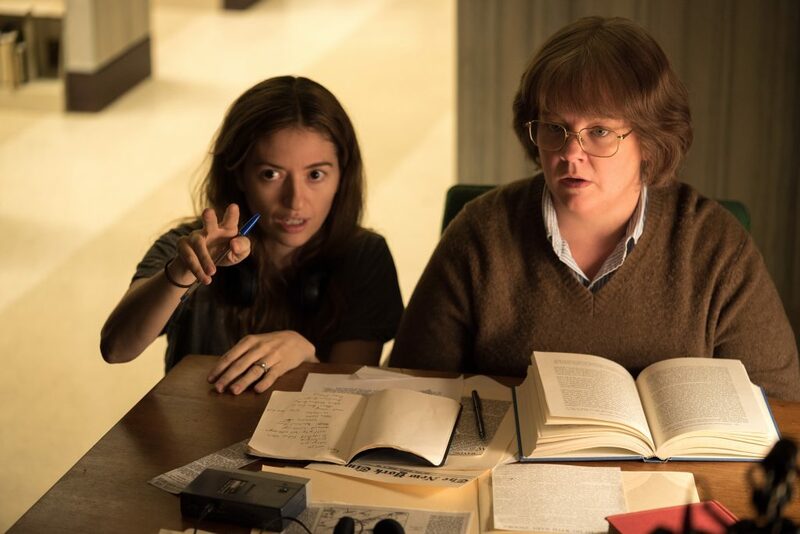 It’s also another example of the brilliance of both Marielle Heller, award-winning director of The Diary of a Teenage Girl, and helmer of the as-yet-unnamed Tom Hanks Mr. Rogers movie, now filming, as well as of iconoclastic badass Melissa McCarthy. Get yourself to a screening, and soon.